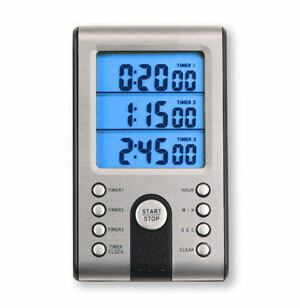 The Professional Digital 3-Line Timer is the ultimate tool to help you track all your cooking chores at one time. Some cooks claim to have an instinctive inner timer, but most people need a little help remembering when to take the turkey out of the oven. Make life simpler and cooking easier with the help of this amazing multitasking timer! The large readout display shows all three times simultaneously to ensure all your dishes come out at the right time. And best of all, the memory function stores up to three countdown times for reuse! That means with your Professional Digital 3-Line Timer you won't have to worry about that over-roasted, dry chicken or undercooked strawberry cake again! Monitor, track and time up to three dishes all on this one handy timer. Large readout display shows all three times simultaneously to ensure all your dishes come out at the right time. Beep alarm when display is hidden. Count-up or count-down timer with alarm. 12 or 24-hour clock and 1/100 stopwatch function. Multiple cooking memory functions to store 3 favorite recipes. Magnetic back with easel style stand that folds flat for storage and hole for hanging. Powered by 2 LR44 button cell batteries (included).